(CBS) - While Facebook's chief executive officer Mark Zuckerberg talks about the exponential growth of sharing, it seems like more people than ever are clamoring for privacy. What if there was a way to really share in a meaningful yet private way? That's what the startup Nextdoor says it's rolling out nationwide today. 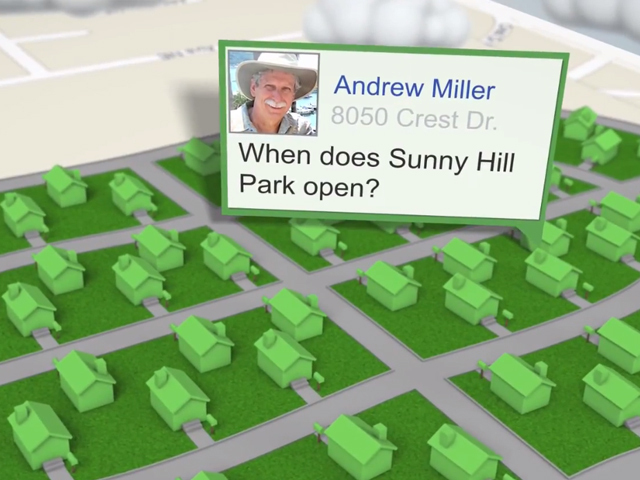 Nextdoor is a social network whose sole purpose is to connect neighbors. Modeled after a typical social network, the service feels like a college bulletin board and chat room in the digital age. It offers a directory of neighbors who have signed up, resources, recommendations and even a market place. Security is addressed by making members verify their home address, requiring real names and HTTPS encryption. Verification comes in the form of a physical postcard mailed to your home with a special code. Another method of verification includes signing up with a phone number or credit card that's linked to your home address. So why do neighborhoods need a social network? According to Pew Research Center survey in 2010, only 19 percent of people knew all of their neighbor's names and 24 percent knew most of them. A whopping 28 percent knew none of their neighbors with 29 percent knowing some. Pretty amazing considering most of us share a wall or fence with these people. I'm of the opinion that a network of neighbors has always been tough to build and maintain, even before Facebook. Nextdoor seems promising because our technology has finally caught up with our intentions. Having learned the lessons of previous of social networks, community groups and bulletin boards, Nextdoor's founders have taken all of the aspects that we find valuable and applied it to one of the most important network we have: our neighbors. Nextdoor's co-founder and chief executive officer Nirav Tolia told CNET, "People are using the technology to bring back a sense of community." Although the site has been in private beta test, Nextdoor has spread by word of mouth to 175 neighborhoods in 26 states. Impressive if you consider there was no advertising, marketing or paid incentives involved. The site is open to everyone today, but don't expect instant gratification. If your neighborhood hasn't been setup, it requires an initial setup and verification.